There are currently 3,874 users on this website. 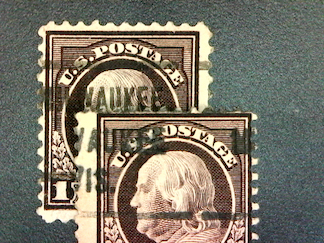 So, I am still working on getting pictures and identifying the hartford stamp in a previous thread, but came across another interesting item. 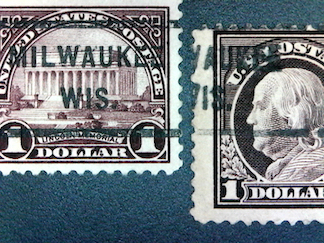 This stamp is from the same Wisconsin classic collection I purchased and am still going through. It is a $1 perf 11. 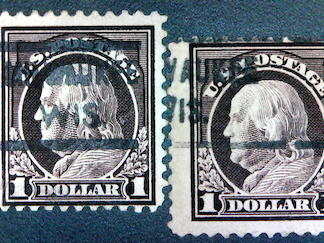 The only $1 perf 11s listed in the classic catalog are for type 205 and type 512. This had a handwritten note - NL-Type 234. 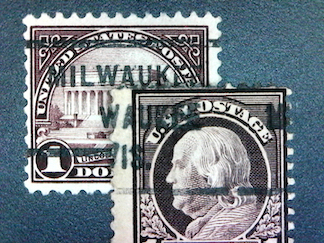 I at first compared with type 205 (Picture 1 - stamp in question is on right). The obvious difference is the period, 205 doesn't have a period and there are no footnotes in the catalog. On the possibility it was unique with a period I looked at the letter spacing (Picture 2) and that doesn't match either. I lined up the E's in milwaukee and the W on the left is pretty far off. I also compared to the 512 (picture 3) but that was quickly ruled out based on the WIS font. So compared to the 234 (of course no classics listed so used a $1 4th bureau). First side by side (picture 4), then one over the other to check the spacing which seems to match or at lest the closest (Picture 5), and finally "matched" them up (picture 6). This does seem to be the best match. No other type (looked at L-10, 236, 237 etc) and nothing is close. Type 236 only has a couple of classics so perhaps it is possible this is a classic 234. 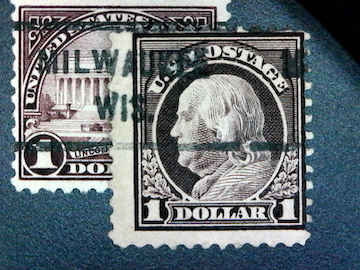 Looks like a type VII overprint but the $1 is not listed so I could be wrong. 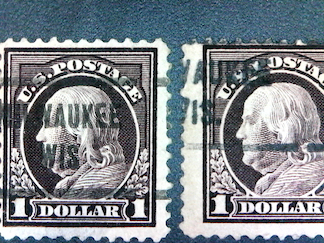 printed by Rotnem Stamp Co.